Seats Still Available for NYT’s Worldwind Global Journey! In journalism nowadays, there’s sell out, and then there’s sold out. The New York Times’s Around the World by Private Jet: Cultures in Transformation might be the former, but it’s apparently not the latter. 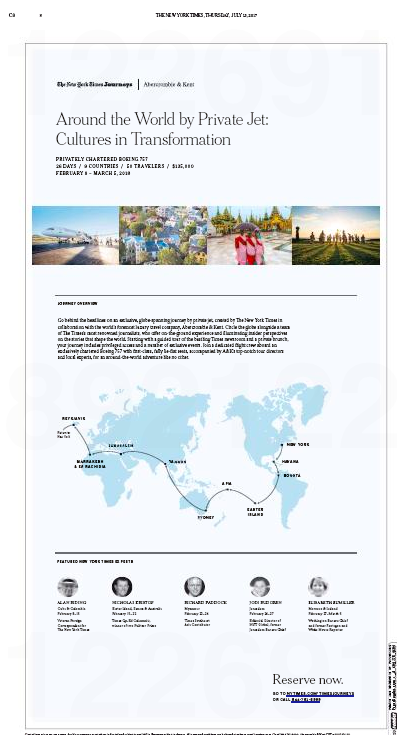 Here’s how the Times Journeys site describes the globetrotting adventure. Fly around the world in a customized Boeing 757 jet for the ultimate in luxury travel. Spend 26 days visiting such places as Israel, Cuba, Colombia, Australia, Myanmar and Iceland. Four award-winning New York Times journalists will accompany you, each for several days as you visit areas where they have expertise. Here’s how the Washington Post’s Paul Farhi describes it. [The Times’s trip raises] a question among journalism ethics experts about ethics and access: Is the Times effectively selling its journalists to private interests? Could, for example, corporate lobbyists or political operatives sign on and seek to influence the Times’s coverage? Other media hall monitors note that these schmooze cruises happen all the time – from The Weekly Standard to the PBS NewsHour. Regardless, this ad ran in Thursday’s Times. The Times global private jet romp might or might not be a sell out. But it’s not yet sold out. This entry was posted in Uncategorized and tagged Abercrombie & Kent, Andrew Seaman, Around the World by Private Jet: Cultures in Transformation, New York Times, Paul Farhi, PBS NewsHour, Reuters, schmooze cruise, Society of Professional Journalists, The Weekly Standard, Times Journeys, Washington Post. Bookmark the permalink. 3 Responses to Seats Still Available for NYT’s Worldwind Global Journey!